In particular the queen, the knight with that awesome morningstar, the faun (or should I say Mr. Tumnus), that hawk-man would be great as some sort of mythic god, katanna guy, and a pig. The swaddled baby is great, and would be good in a village scene (or manger scene if you're decorating for Christmas), thought I suppose a fig-head and a turban accomplishes much the same effect. I'd love to have a skunk as well. BTW, isn't that spy/thief woman just the Black Widow without red hair? Anyway, looking forward to this set. I echo most of your sentiments on this series. I'm particularly pleased that there are very few figs that I really do not care for at all here. Even that mandatory wrestling guy has some interesting parts here. I agree with Bruce. The Satyr is also a nice fantasy figure. The knight is using the taller shield from the S13 Egyptian Warrior. Lots of the non-castle stuff is also nice, and there are plenty of great new parts. I hope I can find a decent price on a case. I'm thrilled with these. I love the animals and figures in general. About the time I'm ready to give up on the collecti figs, they come out with something like this. This is the best one in quite sometime, I am excited about these! I'm a bit surprised to see that the faun's hair is not just a recolor of the Gargoyle's. I'm not surprised to see the longer triangle shield in its "proper" configuration, and I bet we see more of that in the Castle line that follows the Nexo Knights. I hope that mace gets some wider deployment eventually, too. - Interesting that the Faun has a new leg mold, is this foreshadowing of more mythical creatures to come? - The Papoose/swadled baby is perfect for the long overdue LEGO nativity set. We've got all other elements and characters around now to do it! 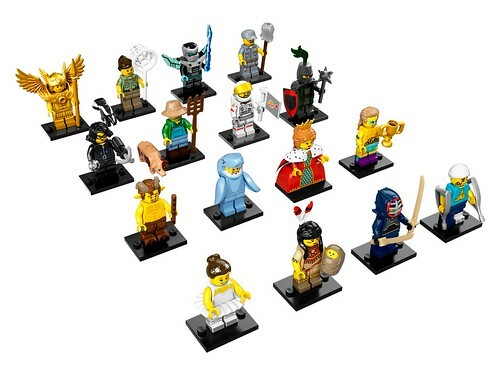 Lots of useful minifigs and parts for me since I have an medieval-fantasy Euro-Asian world. The Satyr's legs are awesome and I like the hairpiece on the wrestler for a barbarian minifig. Great job with this series Lego! This is a great looking series. The Queen is a great figure and it is about time we had a dress piece that made the queen the same height as the king. This series almost makes up for not having a real castle series next year. Just found these in Canada on the shelf at the Chapters store in Guelph, ON. An all around great assortment of figures as there is something for almost everyone in this lineup. My favourites are the classic space astronaut, the animal control officer (it's actually the skunk that I like) and surprisingly the janitor as he reminds me of Scruffy from Futurama. I am pretty glad about the farmer, the astronaut, the knight, and the queen. I will definitely try to get at least the knight. One thing I like about the knight is the shield (I hope to see more of it) and the printing on the legs and torso. Did anyone else notice the playing card faces (spades hearts clubs diamonds) toward the bottom of the queen's dress? I just need an army of armored fauns.